In Release 13 of 6SigmaET, a leading thermal simulation tool for electronics, we’ve introduced a new feature that allows external systems - such as MATLAB - to read from and write to the model dynamically. MATLAB grants greater control over the simulation, enabling for the replication and augmentation of features already within ET. MATLAB also enables the use of advanced PID control systems to be integrated within a model, giving the controls engineer the capability to evaluate the performance of and design for even the most complicated systems. This blog will provide a brief overview of how the integration of MATLAB can elevate the way the controls engineer uses 6SigmaET. MATLAB enables a user to dynamically exchange information with 6SigmaET. With this capability, the user can monitor every component in the model, as well as alter control systems and component power dissipation accordingly–all while the model is solving. 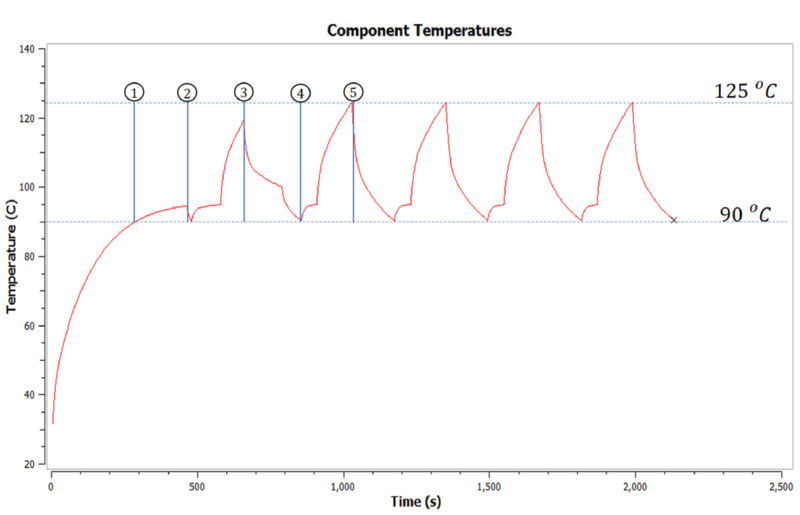 For example, one can preconfigure a change in a component’s power profile during a transient simulation based on a sensor’s input to MATLAB. Similarly, one can monitor and iterate a fan’s flow rate while reporting its impact on a component’s maximum temperature through an internal (within MATLAB) or external (information sent to and from MATLAB) optimization algorithm. This enables rapid maximization of the system’s performance and design subject to a variety of thermal power loads. The use of MATLAB can also augment the capabilities of ET through the inclusion of conditional statements. ET is already capable of having a component change its thermal design power-temperature curve once certain threshold temperatures are achieved, as is shown in Figure 1 below. 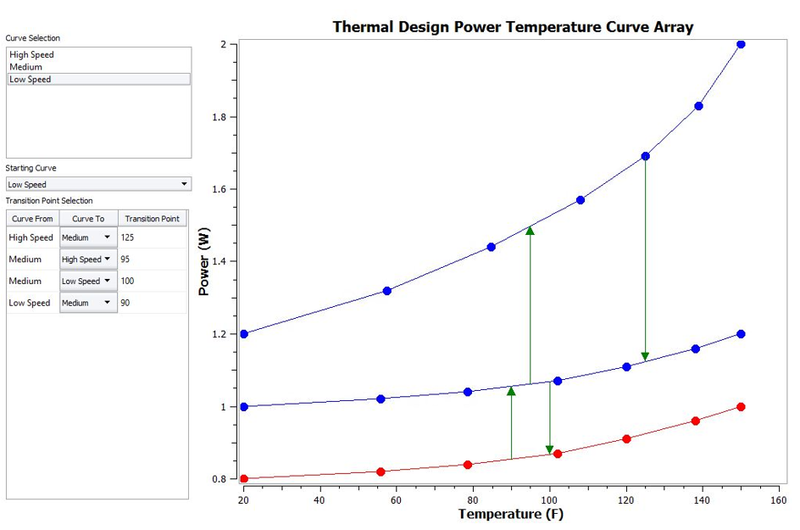 The simulation results shown in Figure 2 verify that over the course of a transient simulation, ET can change Thermal Design Power curves in accordance with the transitions detailed in Figure 1. The illustrations in Figures 1 and 2 can be replicated within MATLAB, and additional features can also be implemented. 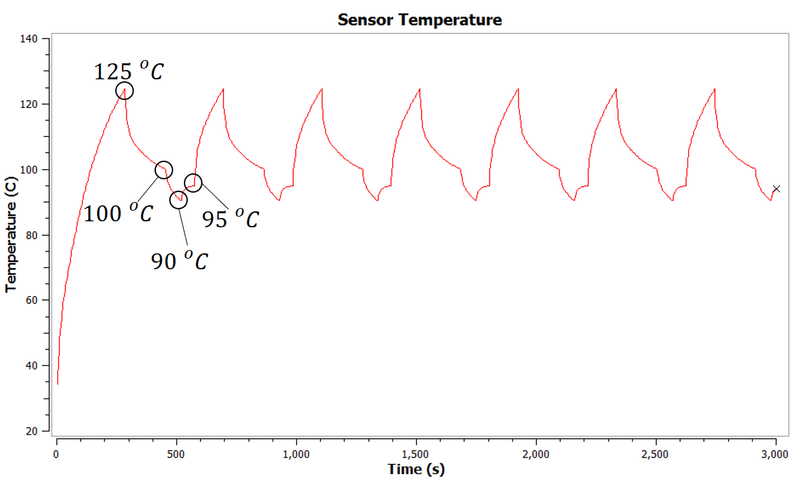 Namely, it is possible to further impose a time constraint on when the Thermal Design Power-Temperature will change curves with code from MATLAB according to the corresponding effect on behavior of the temperature sensor displayed in Figure 3. Highly complex control systems can now be deployed effortlessly, granting limitless design capabilities to controls engineers. This integration not only allows you to implement advanced PID controls in 6SigmaET, but also allows you to verify the performance of a given controller configuration in a system with many independent variables. The response to a given controller setup enables controls engineers to extract valuable design information about the component’s design, then use this to fine-tune a control system using the Control Systems Toolbox available in MATLAB. As a result, any aspect of hardware design may be iterated and tested to perfection in ET before prototyping. 6SigmaET already combines unbeatable accuracy with unprecedented speed in solving the CFD model of hardware devices. When the highly versatile, easy-to-use optimization tools offered by MATLAB are combined with ET, this grants you a new level of design freedom. It allows for dynamic interaction with the equipment file while the model is being solved and for advanced control systems to be designed and tested in a risk-free manner. For more information on how to integrate MATLAB with the 6Sigma software product suite, please see the associated blog on the use of MATLAB with 6SigmaRoom.